Since the Big-Bang of the cyber world, internet becoming public during 90’s, the cyber universe expanding with increasing growth rate. 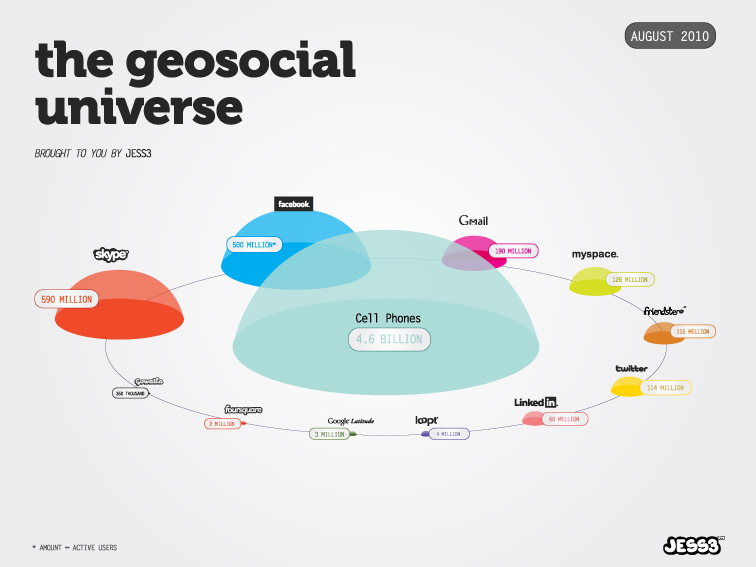 The infographic by JESS3 agency visualizes the status of the current social networks and points to the emergence of new social platforms such as friendster, badoo, besides the well known titans such as Facebook, Skype, Twitter. We see that Skype with 663 million users, is ahead of Facebook in the registered user count. That is an important rationale behind Microsoft’s acquisition of Skype. However, we have to note that Facebook with more than 500 million active users, is still ahead vs Skype with about 180 million active users in terms of active usage. In this regards, we can still clearly say, that Facebook is the biggest active social network. 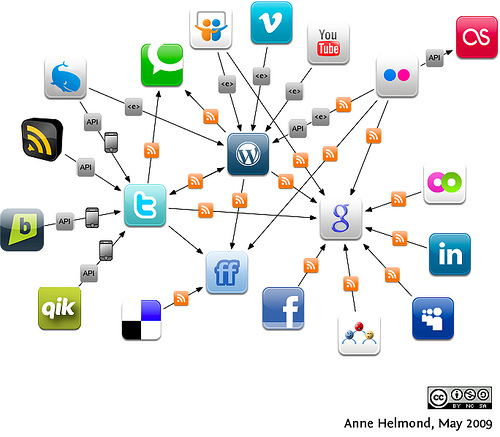 In webmail networks, we see Hotmail leading followed by Yahoo and Gmail. Myspace appears to have passed the point of no return. With a steady decline, it’s gonna be hard for the company for sale to find a new buyer. The “made in china” version of Facebook, Qzone, is soon to reach its original. Some mobile device oriented location based services networks are still the smaller links of the socio-cyber universe, but Google Latitude and Foursquare show some remarkable growth. Facebook has always been in the spot light somehow since its kick-off and it never stops to amaze us with its growth rate. From 2004 til 2011 the company increased its headcount approx. 50% every year and has about 2000 employees as of today. 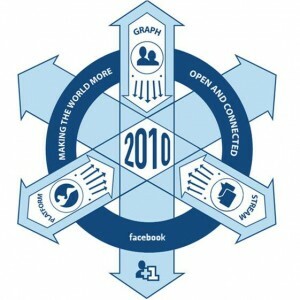 However, the impact factor of Facebook is not the its own economy, but rather the eco-system it created around itself. 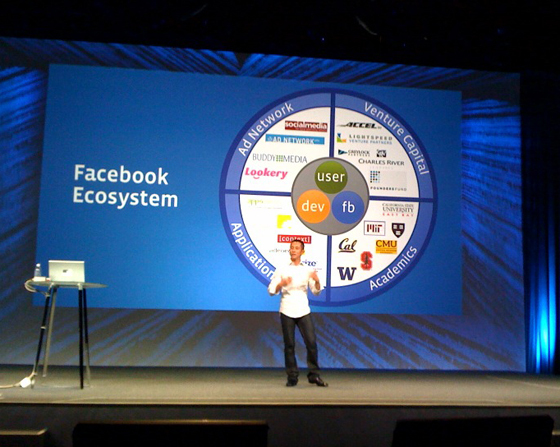 In this regards, since one of the most strategic movements of the company, to open the Facebook API to 3rd party developers in 2009, the job listings including the Facebook keyword increased 245% according to SimplyHired reports. These listings involve mostly non-engineering positions, as well as engineering positions, including a variety of domains such as application development, data analysis, marketing and PR. If we analyze the numbers, we see an incredible growth and even more important an increasing growth rate. 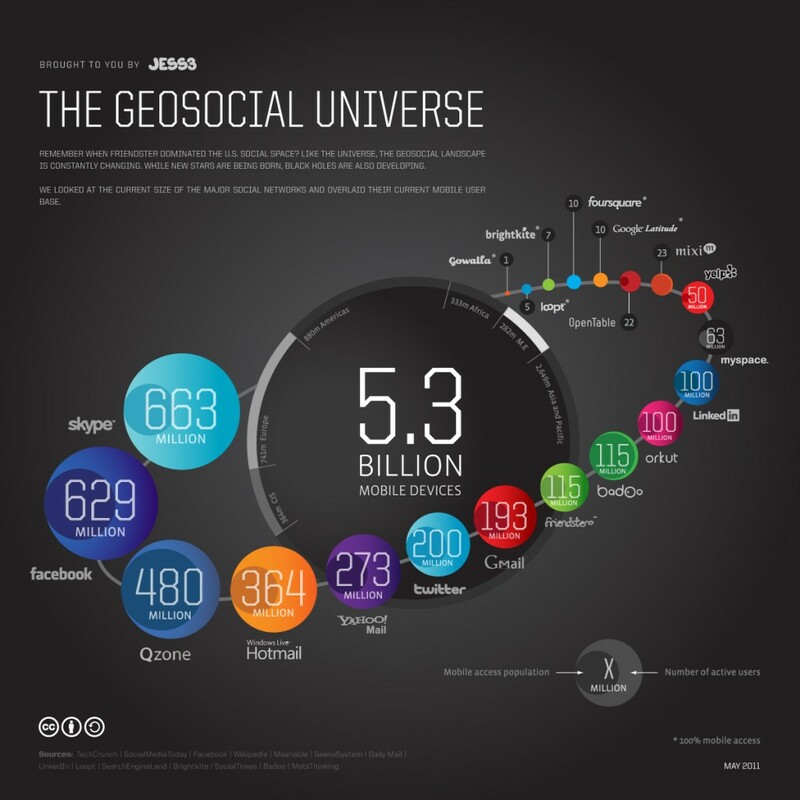 Today, there are more than 550 000 active Facebook applications. Considering it took only 4 years to reach that count, this is pretty huge. However, it is even more striking how much added value these application bring. Even if only Zynga is considered, which is a social gaming company significantly fueled by Facebook, its value is estimated to be around 7 billion $. Another example is Facebook fueled social match making company Snap Interactive, which doubles the 2009 revenues and lists 6.7 million $s revenues in 2010. Quite remarkable! As it seems, while Twitter is still trying to figure out a profitable business model, Facebook is already in a very different page. Air transportation has always been a domain of interesting and complex problems in terms of operation management. It involves numerous uncertainties from planning to implementation, while requiring long resource planing and scheduling horizon. While you can buy a ticket conveniently with couple clicks, there is an incredible e-commerce infrastructure with parallel processing capability (simultaneous ticketing for a spot from numerous agencies), fleet management (harmonization of airplanes for the highest efficiency) and numerous other logistics solutions such as crew management and airport/gate/check-in planning in the back-end. Further uncertainty is induced by the break down/maintenance and unexpected delays. The situation is similar for the capacity planning and pricing of such a complex system. The flexible ticketing options emerged by the demands of the customers induce further uncertainties. In the world of production and service systems, uncertainties have a significant consequence: MORE COST. More costs reflect as higher prices to the consumers. Simply put, the extra capacity needed because of the uncertainties is compensated by the customer – in the lack of competition-. In this case, competition is an important catalyst for the airlines to develop new ways to cope with and compensate the uncertainties as the profit margins are shrinking (such as overbooking). An article in New York Times illustrates how extra we are actually paying and how significant the impact of competition is. If the figure is analyzed, tickets to hub-cities dominated by a carrier, where the competition is weak, are extremely expensive. 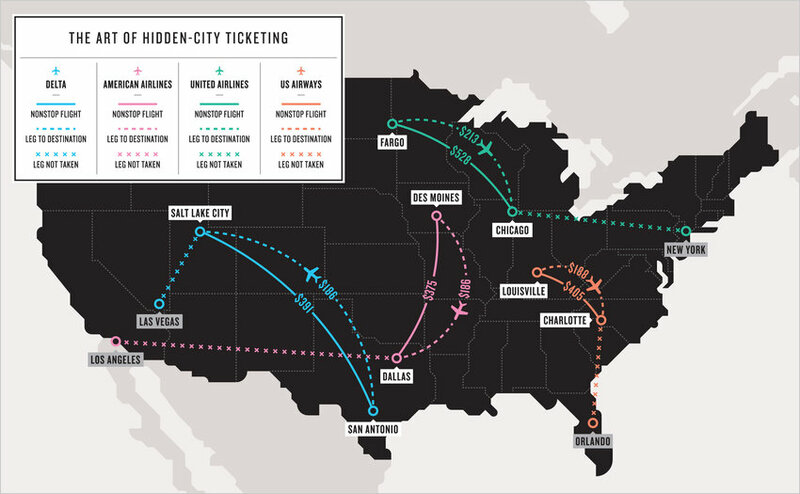 In fact so expensive, that if a connecting flight is added to a destination city with a more competitive market, the prices go down. For example Fargo – Chicago flight costs $528, whereas Fargo – Chicago – New York flight costs $213. Unbelievable isn’t it? In conclusion, if you buy a ticket for Fargo – Chicago – New York and don’t take the connection flight, you can get the half price for Fargo – Chicago ticket. This situation is not apparent in Turkish Airlines domestic pricing, but for international flights, where the market is much more competitive, this is a viable strategy to consider. At the same time this type of inconsistencies, which seem irrational for the customer obviously affect the trust and loyalty of the customer. Just like many of you, I didn’t hear the news that Osama Bin Laden was killed from a TV channel, nor a news agency, nor an official institution, but Tweets bursting out from Twitter, Facebook/MSN IM networks, simply put from friends in a “on the grapevine” fashion and within a time frame of about 3 hours after the first public source. We are observing the evolution of journalism. Actually, I realize that I haven’t read a paper published newspaper for so long that I’m missing the joy of a journey between the pages of a newspaper on a sunday morning. Lets check the numbers first… According to Twitter’s official announcement, tweets about Laden’s death broke the Sustained Tweet Rate record and reached 3000 tweets per second over 10:45pm – 2:20am period. After USA president Obama’s speech it tweet rates reached 5008 tweets per second. This rate can reach the average daily visits of New York Times online (~30million) in about 3 hours. The exponential spread and later the damping of the tweet rate can be noticed by the tsunami like shape in the figure. This quantitative growth raises qualitative concerns, as it is commonly seen that false news go viral on twitter, but 3000 tweets per second is a significant rate. If we approach this emerging trend from the consumer behavior perspective, we consume “news” much like other goods, there are many analogies. After the industrial revolution, the era of mass production emerged, profit by mass production & sales of a single product. When Ford manufactured his first cars, the consumers didn’t used to have too many options, just like everybody used to read the same newspapers and watch the same tv channels in the early years of the media. As the technical improvements evolved, and new production methods emerged, there was a paradigm shift in late 90’s to mass customization. To be honest, we are extremely spoiled. If we think of today’s extreme, you can buy your iPhone/iPad with the configuration you want and with your name laser-written on the back (Henry Ford would probably drown in tears, if he would experience this). This nature of ours is apparent in all types of consumption. We want to have our own choices. When we read news, we want to compile our own configuration with the authors we prefer, fuse the knowledge we want to synthesize through RSS channels, and consume it through the interface we prefer. Products for mass audiences simply don’t make the cut. Especially if news is considered, the time lag of conventional methods results in old news once it reaches to the customers. When establishing our corporate and personal identities, we cannot neglect these changes. The digital world is by-passing the intermediaries and makes us come one more step closer to the source of everything, while a new era is shaping in front of our eyes.